Hotel prices change throughout the year depending on the season. 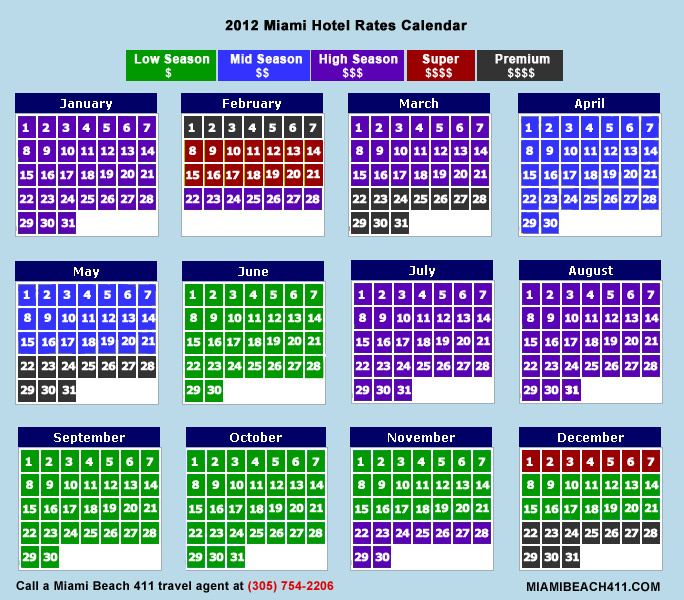 In Miami, hotel rates vary greatly throughout the year. With our changing weather, plus the many events hosted by the City, hotel prices fluctuate constantly. Generally, Miami’s high tourist season is from late December to June, when the weather is best. Low season is from June to October, when the weather is hotter and more rainy. Cheaper prices can also be found mid week, with more expensive rates over the weekend. The prices increase to premium during special events such as Art Basel, Winter Music Conference, and the Food and Wine Festival. Knowing when the rates change in advance can help you save time and money. Use our calendar below to help plan your Miami vacation.